As you may know, I spent the last 2.5 years as an account manager at an advertising and marketing agency in St. Cloud, MN. Flint Group was my home, and I loved nearly every moment there. But unfortunately, as life in the agency world so often goes, my position was recently eliminated in some agency restructuring, and I found myself thrust into the world of job hunting. From hourly refreshes of Indeed.com to numerous LinkedIn messages and dozens of resume and cover letter tweaks, I felt like a college senior again. After scheduling many interviews, I started to notice a common theme. Each interviewer I met with told me that they really want me to be interviewing them and their company as well… and I knew my pause was palpable. I tried to swallow this pit as I smiled and nodded, praising the companies and expressing my extreme interest with as much enthusiasm as I could, but my lack of excitement lingered. Then one night, my phone beeped with a Facebook message, and when I opened it up and saw a name I recognized only professionally, I froze. It was the Executive Director of the St. Cloud Area Convention and Visitors Bureau. She had an opening for a marketing position, and had gotten my name through a mutual contact who knew I was facing the end of my time at Flint Group. Would I be interested in learning more? I almost fainted with excitement. Later that week, I scheduled an afternoon meeting with her, Julie, from the CVB, and it took me approximately 2.38 seconds to realize that my dreams were about to come true. 2 weeks later, I received a phone call. The job – Social Media & Marketing Specialist position at the St. Cloud Area Convention and Visitors Bureau – was mine if I wanted it. And I never even had to apply for it. Through my time at Flint Group, I was fortunate to have the flexibility to go to numerous networking groups, stay very actively involved in the community, and meet a number of influential people in the St. Cloud business community. I built relationships with business owners, young professionals and everyone in between. In my 2 weeks of “unemployment,” I received at least 4 other calls from people who I knew through networking groups who wanted to see if they could help. I was offered short-term positions, side jobs, references and more. And in the end, I technically didn’t even have to apply for my new position at the CVB – my name was referred by a mutual contact through a networking group. I would never have gotten this job without her referral. The point I’m really trying to make here, is to never give up on your networking, because you never know how it will help you. Sure, I was always representing Flint Group at my networking events, hoping to drive sales, awareness, etc. But really, I was representing myself even more than I knew. Was I attending meetings to find a new job? No, not even a little. But because I’ve taken the time & effort to build relationships with other business professionals, I now have a network that I can rely on for more than just sales calls. And honestly, that feels pretty good. To sum it up, I’d like to thank all those in the St. Cloud Area who put their names on the line for me in the name of helping me find my next (absolutely amazing, dream) opportunity. You know who you are, and I cannot thank you enough for believing in me, supporting me, and proving to me that networking really does work. And to the new group of amazing ladies I now get to call my coworkers, thank you for welcoming me with open arms and making me feel like one of the gang from day one. I’m so excited to see what the future holds for me at the St. Cloud Area CVB! If you know me at all personally, you know that I’m the type of person who spends more time cuddling with the dogs and cats at a party than conversing with other humans. I’m an animal freak. I literally kiss my cat goodnight every night, and my family dog is my best friend. So when I was contacted by a sprouting animal rescue organization in St. Cloud, MN, I was immediately interested. The best part? They were looking for someone to volunteer their time to manage their social media spaces. Um, yes, hello, where do I sign? Thus begins my adventures with Grey Face Rescue & Retirement. 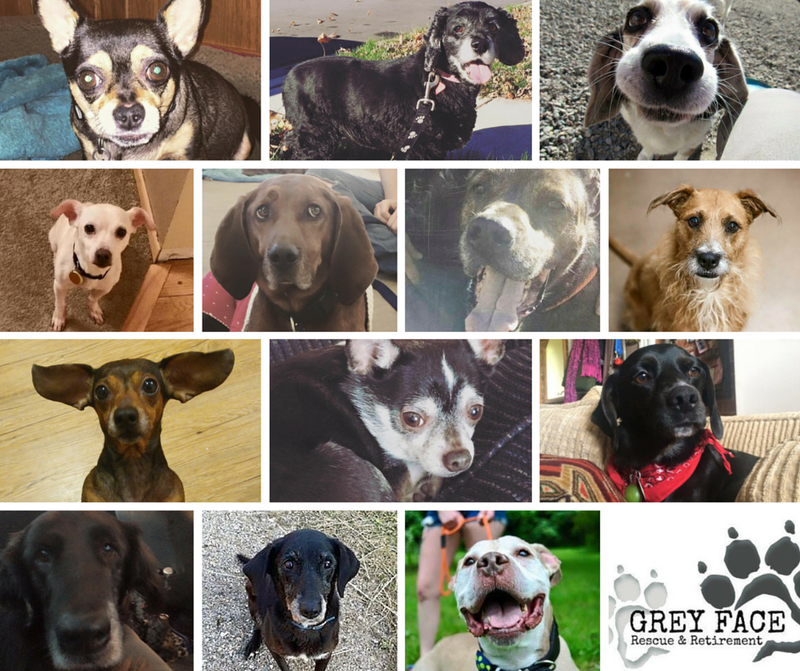 The only senior dog rescue in the state of Minnesota, Grey Face specializes in finding homes for dogs who are 7 years old or better and who are often faced with last-resort situations. We’ve saved a number of dogs off of 24 hour euthenasia lists, and turned shy, agressive pooches with unfortunate pasts into loving family dogs. We find hospice homes for dogs to live out their final days in. And we do it all thanks to the love, passion & drive of an amazing group of volunteers and foster families. Donating my time to Grey Face has been immensely rewarding on a number of levels. It’s an opportunity to help a startup. A startup that supports deserving old dogs. An opportunity to grow my social media skills. To meet other people with similar passions who I might not have otherwise met. A chance for me to expand my network. To learn about how non-profits work. To experiment with fundraising and event planning. I’m so thankful that I got involved with Grey Face, and I am excited to see this organization continue to grow. It is in that spirit that I encourage you to find some way to donate your time. If you’re in the finance realm, find a nonprofit in need of some help with their incoming donations. If you’re a web developer, donate your time in improving someone deserving’s website who otherwise can’t afford it. If you’re in construction, consider donating your time to build or fix things for needy families. Charitable giving is not always about money. It’s about giving your time and skills – and that’s mutually beneficial. I hope you have a wonderful holiday season, and that you consider giving the gift of your time if you can. I promise, it will be a gift that keeps on giving. P.S. Want to know more about Grey Face Rescue? Check out our Facebook, Twitter & Instagram for regular updates. Want to be a foster or volunteer? Ask me how to get started! Diet fads. They’re literally everywhere. Pills, shakes, bars, cleanses, meal plans, supplements, powders – the list goes on and on. But what do these various forms of weight loss plans have in common? They’re all expensive. And with only a select few actually being effective, it’s hard to know which one to trust. Call me naive, but until recently I’d never heard of “Herbalife Shake Shops.” I’d always thought the only way to try the weight loss shake program was to purchase the (expensive) mix and experiment with recipes on your own. Turns out, Waite Fusion will do that for ya! I first found out about Waite Fusion at a St. Cloud Chamber of Commerce event called Chamber Connection. One of the women who work at Waite Fusion, Amy, was attending for the first time, and we started chatting. 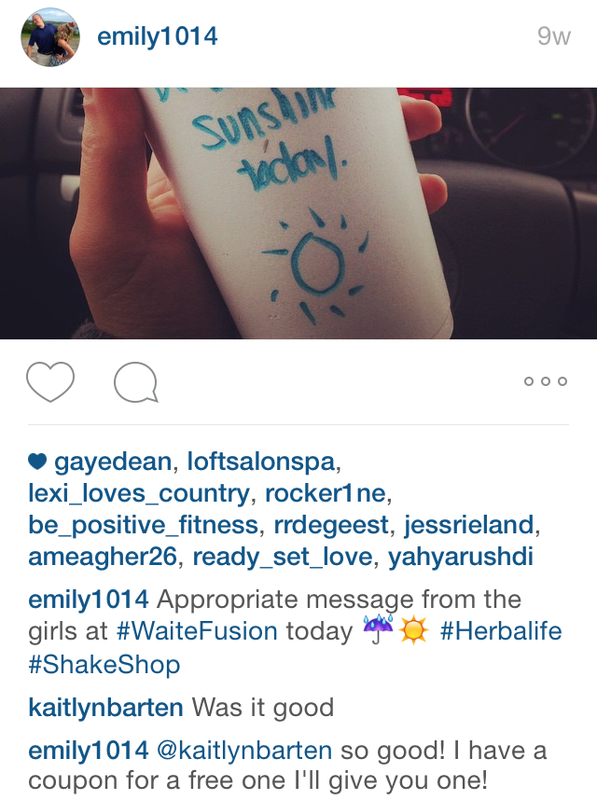 I asked her what Waite Fusion was – having no clue – and she offered me a coupon to come try a shake for free. I’m fairly familiar with many diet trends, including shakes, so I was excited to give it a shot sometime. Plus, her outgoing, friendly personality was a draw for me. One day at work when I didn’t pack a lunch, I decided to try it. Waite Fusion itself is located in a tiny blue house-turned-shake-shop on a busy main road in St. Cloud, close to downtown and St. Cloud State University. From the moment you walk in, customer experience is at the forefront. The music is always bumpin’ happy tracks, the young women who work there are extremely friendly and helpful, and the decor is half college dorm half vintage shake shop. Waite Fusion offers 37+ different Herbalife shake flavors and you can purchase them for $7 a piece. The 16oz shake is meant to be a meal replacement, and also includes a “shot” of aloe and a small iced tea. There are also options to start your own Herbalife journey with one of the coaches, if you’re interested in that, but you’re not obligated to. The first piece of marketing was apparent before I even entered the shop. The coupon that Amy gave to me to try a free shake wasn’t the most beautiful thing I’d ever seen, but it was perfectly informative. It got three immediate points across: Nutritional – not ice cream. Free – no obligation. And Location – very specific directions. Simple and to the point, this is proof that less is more. I eluded to this next one above: Customer. Experience. From the moment I met Amy until I bought my first shake, (and one of the reasons I keep going back) Waite Fusion made my quick lunch stop an experience to enjoy. No pressure to purchase the whole Herbalife system. No hesitation or judgement if you ask questions. Just a pleasant experience that leaves you feeling like you’ve got a new group of friends. When I got my first Waite Fusion shake, it was a rainy, dreary day. I opted for the cherry-dipped-cone flavor (yes, that’s right) and was pleasantly surprised when I received my simple, Styrofoam cup. A colorful message. “Be someone’s sunshine today.” Hand-written in Sharpie. So simple. So affordable. And so, SO effective. Because, as a millennial, can you guess what I did next? That’s right, I Instagrammed a picture. And you know what happened after that? I had about 5 different people ask me about it. And about a week later? Waite Fusion had at least 2 new customers. Not only that, but on a large chalkboard “Selfie Station” at Waite Fusion, they have written #WFShakeSelfie – encouraging people to take a selfie with their shake. And when you’ve got a cute message on it plus you get to humble-brag about being healthy, why wouldn’t you?! PLUS they’ve started to also use the cups as a way to message their customers – for example the below cup from my visit the other day. What a simple, affordable way to communicate with an already engaged audience. Besides the delicious, healthy shakes and the fun, friendly atmosphere, you know what else keeps me coming back to Waite Fusion? Their rewards program. For every shake you buy, you get a point, and for everyone you refer to Waite Fusion, you get two points. Simple enough, but how is that unique from the million bajillion other places that offer rewards programs? Glad you asked. They use the FiveStars points program, which is tied to a mobile app. Every time you visit WF, you just scan your card at the counter, and the points you’ve earned are reflected in your app. Also, the app pushes out messages to users like “Try our new shake flavor!” or “Double-points today!” or things like that. It’s like an SMS program without being an annoying SMS program. And I love it. I will preface this by saying I do not know if they worked with an agency/partner on strategy, so I can’t estimate that cost, but I will say that the efforts listed above are likely not over a $2,500 investment, at most. The coupons? Probably designed, printed and cut in house. 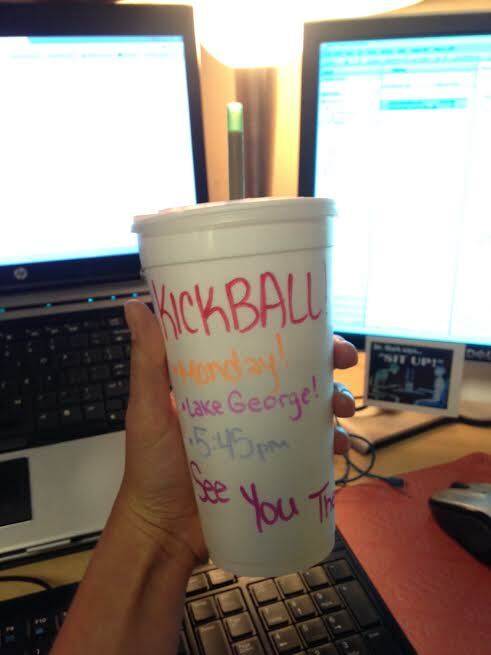 The writing on cups? Um, what’s the going rate for a pack of Sharpies these days…? And the FiveStars program likely has a monthly fee that they pay to take part in, and is where the bulk of my estimate stems from. Oh, and the customer experience? That’s less about investing in marketing and more about investing in the right people to make it happen. So basically, priceless. I am a loyal Waite Fusion customer. I do not do Herbalife in my own time, nor do I have an interest in starting, but I do love the product. And about once a week or so, I indulge in the product, because I love this company that is selling it. Using your resources wisely and engaging consumers intelligently pays off, and Waite Fusion is proof of that. I intend to write once a month about a different business in the St. Cloud, MN area that is doing really well in some aspect(s) of marketing. Specifically, I hope to show other small businesses that, even if you can’t afford a multimedia campaign, you can still be really successful in your marketing if you’re strategic. The other fun part? I’m looking for your input! Have you had a really positive interaction with a local business? Have you seen some kind of marketing material from a local business and thought: “now that’s innovative”? Well then, please share! I’d love your feedback on other local businesses that are killing it with their marketing. Let me know!